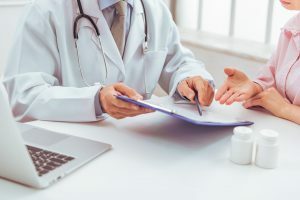 When looking for a medical clinic near Irvine, California, or any surrounding area, there are several key factors to consider – quality care, convenient location, and affordable services. Luckily, here at Vital Urgent Care, we check all of those boxes and many more. Our ultramodern healthcare facility is conveniently located in a centralized location and houses a dedicated staff, including our highly skilled and Board Certified physicians, Dr. Khazaeizadeh and Dr. Sedarati. With years of experience under their belts – or lab coats – our husband and wife physician team is able to cost-effectively treat a wide range of non-life-threatening ailments at our medical clinic. No matter your medical issue, our reliable staff is here to help make your visit to our medical clinic as convenient and affordable as possible. We offer self-pay services that include an affordable flat-rate physician consultation and low pricing for on-site medication dispensing. Additionally, we provide pricing without any surprises or hidden fees. We want our patients to know what our services will cost ahead of time so they are not strapped with an expensive bill they did not see coming. To learn more about our state-of-the-art medical clinic or any of the services we provide for patients in the Irvine, CA, area, contact Vital Urgent Care today.